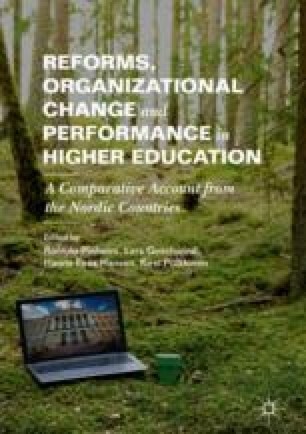 Major reforms in the Nordic countries have increased the formal autonomy of higher education institutions (HEIs) to make decisions over their own activities, both academic core tasks and managerial/administrative activities. The issue addressed in this chapter is how these changes have affected the role of the academic leader. Across the four countries, we see clear signs of change regarding academic leadership comprising a mix of institutional logics in the interviews: the professional, collegial traditional academic leadership, which is based on rotating systems, election among peers, and collegial decision-making, has been complemented with, and in some places replaced by, a managerial logic with top-down order-giving, performance measurement and appointed managers as a new academic profession. Another related general trend is the greater focus on individual managers. The analysis also shows that Denmark and Finland are the countries that lead the way when it comes to increasing the formal authority of managers. The introduction of appointed managers rather than elected ones has altered the way HEIs operate in these two countries. However, as this chapter has shed light on, management reform has not been implemented in the same depth and with the same pace across and within universities. Most chapters in this book focus on specific aspects of organisational life, governance, and management and thus follow the famous recommendation by sociologist Howard S. Becker, to study activities rather than people (Becker 2008). The contribution of this chapter, though, is to complement the other themes in the book by focusing on academic leaders in relation to these activities. Following the lines of New Public Management (NPM; Pollitt and Bouckaert 2011), there is now high pressure for there to be strategic action (Thoenig and Paradeise 2016), accountability, and performance in academia. With more formal autonomy, higher education institutions (HEIs) have become strategic actors competing for reputation and resources in a global market (Krücken and Meier 2006). This development has also put more focus on academic management and leadership (Paradeise et al. 2009), and extensive earlier research has shown that the power, responsibilities, as well as expectations of leaders have increased in the last decades. This has been described as a ‘managerial revolution’ (Amaral et al. 2003) or a ‘managerial turn’ (Krücken et al. 2013). But what do we actually mean when we talk about academic leadership? Much of the earlier research has focused on formal leaders and their personal traits, experiences, and qualifications: vice-chancellors (Goodall 2009), deans, and middle managers such as heads of department (Meek et al. 2010). Traditionally, disciplinary-based departments were chaired by the leading professor (or one of the leading professors; (Pechar 2010). This model has now, in many HEIs, been replaced by professional managers who are not primarily in these positions based on their academic credentials but rather based on their management skills and experiences. There has also been a transition from the classic rotating system—where the members of the ‘community of scholars’ (Nybom 2007) took turns in office, elected by their colleagues—to organisations with line management—where managers, from the unit level to deans and vice-chancellors, are appointed (Haake 2004). This has transformed how we think about academic leadership in a fundamental way (Degn 2018). Furthermore, there are also a number of other positions without line management responsibilities but potentially have great influence on everyday academics’ lives, including but not limited to directors of studies, programme directors, and research leaders. Evermore structured education programmes with demands on coherence, progression, and constructive alignment have proliferated in the last decade, not least since the implementation of the Bologna Process (Witte 2006). Programme directors have become key individuals in this development with large responsibilities for staff, students, and quality in the provided courses. On the research side, we have experienced a development towards bigger programmes, centres, platforms, and other initiatives that require leadership and management skills (Hansson and Mønsted 2008). In both education and research, external stakeholders also play important roles whilst holding universities accountable for their actions (Benneworth and Jongbloed 2010). Last but not least, new professional support staff have been hired in order to tackle all the demands of and opportunities from the university management and from external stakeholders (Karlsson and Ryttberg 2016). This complexity in terms of responsibilities, reporting, accountability, power relations, and line management has become part and parcel of academic life. These complexities seem to have been strengthened in many countries due to NPM, and with many other leadership roles that have emerged as well. In the PERFACAD project, all these leadership roles have been discussed and recognised. In this chapter, we study to what extent higher education reforms over the last decades have changed academic leadership. The following main research question is asked: how can the roles of academic leaders be understood in the light of recent reforms? Our analysis is based on classic aspects of management and leadership, all reflected in the themes of the rest of the volume: notions of power and responsibilities, strategy formulation and follow-ups, and the evaluation and assessment of performance. Before turning to our findings, we discuss our key concepts. The dominant critique paving the way for NPM reforms stressed the idea that equity, freedom of choice, and the ability to prioritise in the interest of society instead of one’s own individual interests, to produce expected results and to accept external control, were not met through professional bureaucracies in universities (Carvalho and Santiago 2016). Following this criticism, the assumption was that collegial and professional bureaucratic structures should be replaced by new types of decision-making structures to make public organisations more flexible. By altering these sectors through reforms, universities were expected to become ‘complete’ organisations through decentralisation, delegated autonomy, and the unification of structures and decision-making channels (Krücken and Meier 2006). Consequently, one core aspect of NPM is managerialism, or ‘new’ managerialism (Deem and Brehony 2005), emphasising the management of public sector organisations through rational structures, standardised procedures, and clearly defined responsibility and accountability. Earlier research has shown how practices from the private sector have challenged and transformed the public sector (Flynn 2002). In studies of the higher education sector, this development has been contrasted with professional, collegial ideas of leadership (Deem 1998). Lately, a growing discussion on ‘leaderism’ has developed, described by O’Reilly and Reed (2010, 960) as ‘the belief that many core aspects of social life can and should be co-ordinated by one or more individuals who give direction and/or purpose to social activity conducted by themselves and others’. There are indeed differences between managerialism and leadership related to the concepts of ‘management’ and ‘leadership’, respectively, where the latter is more positively connoted, but it is common for these NPM-related trends to place an increased emphasis on individuals in management positions. This has also fuelled critical management studies, questioning ideas of a ‘strong leader’ with masculine features (Alvesson and Spicer 2012). A recent example of this research is an article by Ekman and colleagues who have shown how managerialism and leaderism discourses have played out in Swedish state inquiries on higher education. The state committees have continuously questioned the current status of academic leadership, and there are frequent calls for stronger leadership and more managerial power in a deregulated higher education sector (Ekman et al. 2017). A way to explore the different connotations of academic leadership is to apply the approach of institutional logics with a focus on the symbols and practices that guide actions in organisations (Thornton et al. 2012). Such practices and symbols are institutionalised and taken for granted. Different logics can work side by side in an organisation and bind the work of different professionals together, yet logics are often conflicting and competitive (Greenwood et al. 2011). The traditional logic in the university sector has been professional logic based on collegiality. Professional logic is rooted in the platform of knowledge acquired from education and training in the actual profession or academia (Abbott 1988). The work of professionals relies on discretion, trust, autonomy, and collegiality, and decision-making is consensus-oriented, collegial, and bottom-up. The criteria of selection are based on professional skills, and the best amongst peers are selected (Sahlin and Eriksson-Zetterquist 2016). Different types of professionals advocate distinct ideas on how to practice management (Abbott 1988; Freidson 1994). There is a strong focus on preserving the interests of the profession that cohere with the priorities, identities, and values of the professional group. As a means to change the perceived ineffectiveness of this professional logic, ‘managerialism’, inspired by market logic, was introduced by NPM-inspired reforms, and the idea was to strengthen the managerial role. A role is viewed as an external attribute and is linked to social positions within the social structure, and there is an expectation that the role will influence the identity of the academics. The identity is viewed as internal, consisting of ‘internalized meanings and expectations associated with a role’ (Stryker and Burke 2000, 289). The strengthening of the managerial role is done by altering managerial structures and by introducing new institutional logics with more focus on efficiency, budgetary discipline, and cost reduction. Following this, there is more attention on the management of resources and performance, and therefore different types of controlling systems as assessment, metrics, and management by objectives have been introduced (Christensen and Lægreid 2011; Pollitt and Bouckaert 2011; Flynn 2002). In this new role, there is an emphasis on the division of labour and hierarchical relations (Rost 1993). Rational planning and the distribution of tasks from the leader to the follower are seen as crucial processes (O’Reilly and Reed 2010, 2012). The manager is loyal to the organisational objectives and has to be able to develop new strategies accordingly as well as adapt to changes in the environment. Managerialism is system-oriented in the sense that the managers try to influence the followers by formalised controlling systems (Ladegård and Vabo 2010). Decision-making is top-down with an emphasis on hierarchy and line management. Managers show loyalty and identify with the organisation. Increased accountability is one of the solutions to achieve improvements (Christensen and Lægreid 2011; Pollitt and Bouckaert 2011) along with a strengthening of the managerial role. Technologies, such as metrics and assessments, that discipline the behaviour of actors, are also a means to direct the organisational attention and focus (Cantwell and Taylor 2013). This could be done by translating the institutional strategy into a set of goals reflected in performance measures that make success (but also failure) more concrete for everyone (Melnyk et al. 2004). In this way of managing, the aim is to shift focus from input and bureaucratic rules and procedures to the output through goal-setting and the use of performance information (Hvidman and Andersen 2013; Christensen et al. 2007). Performance-based funding is believed to incentivise institutions (and individuals) to improve or maintain their level of performance in exchange for higher revenue (Dougherty and Reddy 2011). Based on the discussion earlier, we analyse cases in relation to how perceptions of the managerial logics co-exist with, complement, or come into conflict with the professional logic. The consequences of university reforms, made with the aim to make universities in these four countries more ‘manageable’ or ‘well managed’, will then hopefully come to the fore. These broad themes were addressed in all interviews (total number 93) with academic staff, administrators, and managers. The themes were also useful concepts for analysing the data using the NVivo software. The interviews included at the top level, senior leaders from central university management; from the mid-level, deans, or their equivalent; and lastly, at the academic level, units, departments, groups, or programmes. The interviews were undertaken at two universities in the respective countries, one of which is referred to as the ‘flagship university’ and the other as the ‘regional university’. We start with a short description of the current systems and regulations in the four respective countries. In Denmark, the reform introduced in 2003 led to dramatic changes. Following earlier attempts at strengthening the management at universities, the government finally gained support for radical changes that effectively abolished the collegial governance model. The aim was to make universities more competitive, among other things, by strengthening the power of managers at various levels. The reform had two key elements: the first was the establishment of a board of directors with an external majority and where the chairman also had to be from outside the universities. The second was replacing the former elected managers with appointed ones. This introduced a line management model, where the board hired the vice chancellor, the vice chancellor hired the deans, and the deans hired the head of departments (Degn and Sørensen 2015). In the early 2000s, there was an increased autonomy implemented in Finland by the performance agreements between the universities and the Ministry of Education. These agreements also emphasised efficiency, effectiveness, and performance management. By 2006, university-steering reforms were implemented with defined performance-management systems using data from national university databases and financial statements. These steering instruments increased the need for internal university performance management. The Finnish universities of the 2010s have a strong administrative and financial autonomy. The level of institutional autonomy has become more complicated with more focus on external funding, institutional profiling, and less collegiality in university governance. This has strengthened the role of line managers in performance-management issues. At the same time, lower-level leader roles maintain strong in setting academic priorities (Aarrevaara et al. 2011). However, their role in these universities is not strong in performance management, as academic units, such as research groups and educational programmes, are not performance units. This role is reserved for appointed middle managers at the faculty level. A central reform regarding the governance of the Norwegian higher education sector was introduced in 2003 (St meld nr 27 2000–2001). The aim of this reform was to increase university autonomy (Stensaker 2014) but also to increase the capacity to react to external changes by centralising and speeding up decision-making (Torjesen et al. 2017). As for leadership, the universities were allowed full autonomy in how to organise and govern at the level below the rector/board, and two leadership models could be chosen (Stensaker 2014). The ‘standard model’, with a vice-chancellor elected by the staff, could continue, but now it would be supplemented by an appointed director responsible for administrative matters in a dual leadership model (Gornitzka and Larsen 2004). In this model, the vice-chancellor was the chair of the board. A model referred to as the unitary leadership model (Berg and Pinheiro 2016) was also offered as an alternative model (this was preferred by the government). In this model, the vice-chancellor was appointed by the board for a certain period and had the full responsibility for both academic and administrative matters, and the law did not demand an administrative director in this model. The appointed vice-chancellor could not be the chair of the board, but an external member of the board would be appointed by the Ministry of Education for that role. The board would consist of 11 members: four elected by academic staff, one elected by administrative staff, two elected by students, and the remaining four appointed by the Ministry of Education. The autonomy in choice of leadership structures has resulted in a hybrid system within many institutions, as there might be both elected and appointed leaders—still most vice-chancellors are elected (Stensaker 2014). An important reform in Swedish higher education is the so-called Freedom Reform from 1993, which increased the formal autonomy of HEIs in a fundamental way. A new funding system was introduced based on the admission of students (input) and graduation (output), and university managers were also made more autonomous in issues regarding the hiring of academic staff and which programmes to provide. The increased freedom for HEIs was accompanied by a national evaluation system developed during the 1990s. Strong academic leadership was requested, and the ultimate role of the vice-chancellor as the institutional leader was emphasised. The government strengthened academic individual leadership by explicitly pointing to the vice-chancellor as the institutional leader, and, without directly arguing against the traditional collegiate model, the government expected a more corporate management-like style of internal governance (Askling et al. 1999). The idea with external stakeholders in the university boards has a long history in Sweden, emanating from the great higher education reform in 1977. In 1997, it was decided that there should be an external person acting as chair rather than vice-chancellor (Benner and Geschwind 2016). The next reform affecting leadership and management specifically was the so-called Autonomy Reform introduced in 2011. One of the main novelties introduced was the increased freedom to create academic positions and career tracks, apart from senior lecturer and professors, whose positions remained centrally regulated. Also, the governance and steering regulations changed. Collegial bodies like the faculty board were deregulated and made non-mandatory. As a consequence, many HEIs have made collegial bodies advisory rather than decision-making organisations. As in Norway, the reforms have not been compulsive and mandatory, which means there is significant variety in terms of, for instance, appointed or elected leaders and recruitment patterns. An overall pattern is that the older HEIs harness the collegiality and traditional primus inter pares model, but there is variation also within universities (Engwall 2014). In the survey, we asked managers a general question regarding decision-making power in relation to four themes: budgetary matters, staff recruitment, strategies, and performance indicators. The results are summarised in Table 6.1. Question: Does your current position include decision-making in the areas stated below? As we see from the table, strategy is the area in which managers’ decision-making power seems most prevalent, with Sweden on top with as much as 88% of managers responding positively. In some categories, there are significant differences across countries, most notably for budgetary matters, where three-thirds of the Swedish managers and two-thirds of the Finnish managers report having decision-making power, whereas not even half of the managers in Denmark (48) and Norway agree or strongly agree that they have decision-making power. Also, regarding staff recruitment, the differences are remarkable: only half of the Danish respondents indicated a 4 or 5 on the 5-point scale, whereas in Finland (69) and Sweden (71), this was more common. Generally, a comparison across the four countries shows that the Danish managers responded that they have little power in these categories. In contrast, Swedish managers’ responses included the options ‘agree’ or ‘strongly agree’ to a much higher degree. However, the degree of real hierarchical steering is quite different between universities. In the regional university, the hierarchical model seems very ingrained and (sometimes reluctantly) accepted. However, in the flagship university, some of the collegial culture seems to have survived (as the quote above indicates). It is harder to get things done if there is opposition from below (be it subordinate managers or academics) and decisions, once taken, are also easier to revisit and change. Managers have quite strong authority over resources and budgetary matters, at least on paper. General university funds can be spent rather freely. However, most of these funds are invested in the salaries of steadily employed professors, making a change in priority somewhat difficult. In addition, there is the growing amount of external funding. Managers have very little means of influencing research based on external funding, which means that directing through external funding is very much delegated to the academics themselves, who decide what they want to apply for funding for, and to funding agencies and other funders, who make decisions on funding based on own criteria (see Chap. 5 in this volume). Finally, performance-based funding systems also pressure managers in budgetary matters since these models pressure managers into following the national model internally—to some degree at least (see Chap. 4 in this volume). These conditions could be part of the explanation for why the Danish managers scored low in the survey, compared to the other countries, on decision-making power over budgetary matters. This means that one of the most effective ways of steering performance is by hiring and firing. Hence, hiring is one of the most important instruments for managers who want to manage performance. It is more mixed when it comes to firing. In one department, at the regional university, management fired several people who were not performing well on research (this was phrased as ‘cleaning up’). Here, firing was seen as an effective performance management tool. In the flagship university, this was more unusual. Hiring new staff was most often only possible when someone resigned or if there was new funding—not by firing. As the survey results suggest, managers feel they have quite substantial decision-making power over strategies. Managers generally feel that strategies are important. They spend considerable time on planning the processes for shaping strategies. Sometimes they are quite top-down, at other times they are organised to involve a range of internal and external stakeholders. Lower-level managers generally do not feel too restricted by upper-level strategies. A typical quote on the question of the coupling between strategies was ‘They are coupled [everybody laughs]. They [the strategies] are not integrated, yet they are not completely free-floating in the sense that I have looked at the faculty strategy’ (Flagship, manager, DK). As a managerial tool, though, most researchers do not find that the strategies mattered much for work ‘on the ground’. Here, performance-management instruments, like performance indicators, are much more important. Managing performance is practised by all managers to some degree. It does, however, depend on local conditions if the management is mostly ‘soft’ (i.e., no or small incentives, hiring new personnel only when natural vacancies occur, managing by employer development conversations, etc.) or ‘hard’ (i.e., firing researchers who do not perform, using bibliometric research indicator [BRI] metrics as a goal-setting tool, giving bonuses for publications, etc.). Managers were given a new performance management tool when the BRI was introduced in 2010. Although it only distributed a small fraction of total funding for research, management at the regional university viewed it as a powerful tool for improving the research performance of the university. Managers used it as a tool by demanding that researchers within a two-year period scored points on the BRI scale (which means publishing in at least one of the journals on an authorised list). Hence, introducing the indicator in the budget model had a very disciplining effect all the way down to the researcher level (although mostly in the social sciences faculty). However, at the flagship university, the BRI was not used as extensively as a performance-management tool, and when it was used, researchers did not see it as very disciplining. Instead, managers use mandatory employee development conversations (which are also mandatory in other public sector workplaces) to talk about goals, achievements, and so on. But these mostly feel like conversations to help the individual progress, and less like a method for controlling the performance of individuals. These are also used at the regional university. Monetary incentives were not used in any of the departments among our cases. However, there are departments in Denmark that have linked BRI publication directly to bonuses. Although we do not know the full extent of this practice, it is not merely a curiosity (Opstrup 2014). The managerial role has been strengthened over the last few years in the Norwegian HEIs hierarchically, not least by the use of strategies and action plans. Still, it seems like the role of the head of a department has been weakened (hence the term ‘facilitator’). This could be tied to the fact that this role is seldom attractive for senior professors, and attending professors often see this as their duty for a few years. The role is thereby often undertaken by junior academics with a temporary contract and as a part-time job. The department head position works as a stepping stone into academia for juniors who do not have the same legitimacy as a professor. There is a general trend that suggestions for overall strategies at the universities are developed by the vice-chancellor, who is thereafter open for hearings and the broad involvement of all employees. The chosen strategy is expected to be reflected in the strategies within the hierarchy. At the faculty level, the process to develop strategies seems to be the same, while at the levels of departments, there are more variations. Some leaders use the same approach—to shield the academics from administrative tasks—while others use a more democratic and collegial approach and collect input at an early stage of strategy development. Managers do not interfere with the research of the individual academics, who have considerable freedom to choose whether they want to apply for internal or external funding in addition to the amount of research time they have available in their position. Still, the close ties between strategies and funding seem to be an organising principle that steers the focus of the academics too, as one manager illustrates: ‘The researchers are opportunistic, so when the money and incentives are tied in one direction, the researchers head that way’ (Regional, manager, NO). Another leader discussed academic freedom and the risk for dilution as the professional work has to adjust to plans and strategies but also pointed to the advantages that follow: ‘At the same time, I can see that those who actually chose to fit into the profile are getting a boost, so it seems like there are two answers out there’ (Flagship, manager, NO). A manager from the administrative hierarchy pointed to the tension of logics between academics and the administrators. One example was a professor who had not filled up the classroom and had room for more students, and the administrators who wanted to follow the procedures of admittance: ‘They do not quite understand why we are doing things this way’ (Flagship, administrator, NO). Conflicting demands not only came from within the institutions but also from external stakeholders regarding content in research, financial issues, and, particularly, ownership of the product: ‘There are still discussions in each project agreement regarding the ownership of rights and what time you are allowed to start publishing. The postponement of publications is always up for discussion’ (Regional, manager, NO). Strategies are also used to guide the recruitment of new employees. A manager told how they use their discretion to strengthen areas important for them: ‘As to be expected, recruitment must be done according to the strategies. And this means that we are trying to enhance our strengths or areas we find worthy to continue’ (Regional, manager, NO). More than half of the managers in Sweden noted in the survey that their current position includes a high degree of decision-making powers about strategies, budgetary matters, and staff recruitment (Table 6.1). Their power to make decisions about performance indicators is a bit more limited. As in Norway, strategy is the area over which the managers seem to have most influence, where 88% of the managers claimed to have a degree of decision-making power 4 or 5 on a Likert scale. There are discussions at both universities whether, for instance, bibliometric measures should affect salaries. According to one interviewee, this is primarily advocated by those who can show good bibliometric data for themselves. However, it is also mentioned that too much of a focus on publications could have a negative effect on other parts of academic work: ‘We cannot have a workplace where everybody sits at home and splashes out papers, but no one is in the office. […] From my perspective, it is very important to have people who can collaborate, but we don’t measure that’. (Flagship, manager, SE) Performance is therefore a broader concept than research output only. Bibliometric data are a basis for the discussion rather than a ‘hard’ criterion related to rewards. At the flagship university, there are differences between different faculties. One of the faculties recently introduced the individual measurement of academic staff performance. This has been controversial and was met with deep scepticism by the other faculty members according to the interviewees. The aim of this chapter has been to shed light on the role of managers in higher education institutions. Major reforms in the Nordic countries have transformed HEI systems in a profound way (see Chap. 3). They have increased the formal autonomy of HEIs to make decisions over their own activities, both academic core tasks and managerial/administrative activities. The preceding, more state-regulated system meant detailed centralised decision-making about, for instance, hiring of professors and the introduction of new educational programmes. The new autonomy has led to the introduction of new managerial practices in HEIs in line with NPM and inspired by private firms: strategy-making, strict budgetary management, performance measurements, and so on. The issue addressed in this chapter is how these changes have affected the role of the academic leader. Drawing on earlier research on managerialism and leaderism in higher education (O’Reilly and Reed 2010; Ekman et al. 2017), we see clear signs of change regarding academic leadership in these four Nordic countries. Overall, we see an interesting mix of institutional logics in the interviews: the professional, collegial traditional academic leadership, which is based on rotating systems, election among peers, and collegial decision-making has been complemented with, and in some places replaced by, a managerial logic with top-down order-giving, performance measurement and appointed managers as a new competitive academic profession (Thornton et al. 2012). Many interviewees mentioned the increased focus on these kind of management practices. Another related trend is the greater focus on individual managers. This is the case in all four countries albeit with slight differences in emphases. There are also mixed feelings regarding this managerialist/leaderist trend. For some of the interviewed academics, the development was deeply worrying and a major concern. This is particularly the case in Denmark. For others, particularly in the Finnish interviews, it seems that, for instance, increased transparency in reporting and communicating performance could be considered positive. The analysis also shows that Denmark and Finland are the countries that lead the way when it comes to increasing the formal authority of managers. The introduction of appointed managers rather than elected ones has altered the way HEIs operate in these two countries. However, as this chapter has shed light on, management reform has not been implemented in the same depth and with the same pace across and within universities. Hence, the ability and willingness to follow a strict, more corporate-like management style are unevenly distributed, although some commonalities can be found (Lind and Aagaard 2017). The role of individual leaders has also increased in other countries, as shown in the interviews from Sweden in which the vice-chancellor’s role at both HEIs was considered big and increasing over time. A similar pattern is appearing in Norway, where the strategising process was initiated from the vice-chancellor at one of the HEIs. There are also indications in the interviews that power has been centralised—that is, a strengthened steering core of HEIs. However, this increased power of managers, which appears clearly in the interviews, is still compromised, and the complex matrices of organisations that universities make up are still challenging to lead. Some of the interviewed Swedish managers even discussed what they perceived as a need for more managerial power over resources at various levels. They aired a frustration when it came to making priorities and to launching strategic initiatives. This partly reflects the national debate on the balance between external funding and direct state funding. A prerequisite for more managerial power is more money directly allocated to HEIs rather than external competitive funding, which strengthens individual researchers and research leaders rather than managers. Another theme is performance management—that is, identifying, recognising, and rewarding academic staff in relation to their efforts in education and research. Across countries, it seems that there is more focus on performance and performance management. In Denmark, and to a certain level in Norway, the BRI has become a new managerial tool and is also used to some extent at the individual level for performance follow-ups. Performance is not followed up at the individual level in most places in Sweden and Finland. Annual staff appraisals are not based on performance data, but salaries are rarely affected by the level of performance. The increasing awareness of performance measurement among academic staff also affects managerial roles. In Sweden and Denmark, the role of the manager seems to include coaching and career counselling more than controlling. Early career academics are highly aware of career demands regarding performance and want guidance when it comes to making priorities. Also, the interviews from Norway indicate that the publication indicator affects individual researchers to a high degree. The topic of management and leadership has been related to different kinds of HEIs in earlier research. Older, research-intensive, comprehensive universities have typically held on to elected leaders, and collegial bodies have been maintained in national systems where this has been possible (i.e., Sweden and Norway). In contrast, younger institutions have introduced a stricter line management structure with more emphasis on professional management skills rather than academic merits for holders of management positions (Engwall 2014). Sweden, and particularly Denmark, reveal some interesting albeit expected differences between the older flagship university and the regional university. The line management is stronger, the collegial bodies are downplayed, and decision-making is more top-down in the younger institutions. It also seems that resistance is stronger at the older universities, in particular, at the Danish flagship university. The final conclusion is that there has been a convergence in reform initiatives, and many ideas have indeed been used in all four countries with deep consequences for academic leadership and management. However, the implementation of the reforms differs significantly across and within countries and institutions. There is a consistent, complex interplay between the two co-existing logics of managerialism and collegiality (Greenwood et al. 2011), a balancing act for managers whose power has increased to a degree that seems to frighten their co-workers but, nevertheless, for some, is frustratingly compromised. Benner, M., and Geschwind, L. 2016. Svenska universitetsstyrelser och politisk styrning – 40 års erfarenheter. Forskningspolitikk. http://fpol.no/svenska-universitetsstyrelser-och-politisk-styrning-40-ars-erfarenheter/.